It’s funny how she knows just what to say to cheer you, make you laugh and support you. Mom is truly amazing! 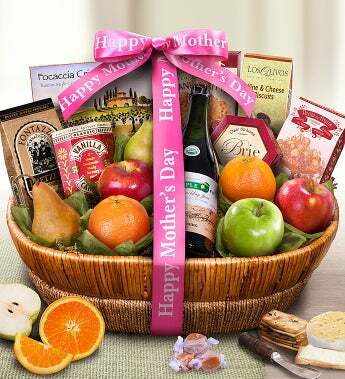 Make it a very Happy Mother’s Day with this gift basket full of juicy Comice or Bosc Pears, navel oranges and 3 different varieties of seasonal apples. Complement the fruit with rich Brie Creamy Cheese Spread, Focaccia Crisps, Organic Sparkling Cider, and much more! Artfully presented in an elegant, collectible willow and sea grass basket. It's true delight. Bite after amazing bite. She'll love it but never more than how much she loves you!